Once again this year (2010) I have taken 18 students from Broward College for a five week study trip to Italy. We have been back for three days now and are barely over the jet lag. Once again the students studied at the University of Urbino and traveled to Venice, Florence, Rome, with minor excursions to San Marino, Assisi, Gubbio, San Leo, Verona were they were treated to a magnificent production of Verdi’s opera Aida in the Roman arena choreographed by none other than Franco Zeffirelli. After the initial culture shock the students immersed themselves in Italian culture whose language they studied in the morning. This year we even added a course on Italian films shown in the afternoon which attracted even those who were not taking the course. They delighted in the famed Ducal palace, the gelati, the cafes, the good wine, the good food at the University mensa, the beaches, the excursions to Assisi were they saw the famous Giotto frescoes which begin Italian humanistic painting, the extraordinary Renaissance art, architecture, monuments, museums, gardens. They seemed to be particularly struck by Venice, the first city which they visited for three days. They even bought new luggage to bring back souvenirs of Italy to their dear ones. And so it went for five whole weeks. The trip could not have been more successful in providing those students with a first taste of Italy and inspiring them to eventually return on their own. I think they’d be the first ones to concur on such an assessment, judging from the evaluations they have submitted on the program. It bears mentioning here that the program is open to students of other schools and even non-students as long as they register for one course at the college. Next year we hope to enroll a larger number. Indeed, Italy seen with fresh eyes as a tourist, albeit studying at a university, is an incredible experience, it could even be a transforming civilizing and humanistic experience for those who appreciate what it has to offer in the humanities and the arts, literature and philosophy. Invariably, one detects that some of those students have indeed had such an experience while the more superficial ones among them (and there are always a few of those) go abroad to get stoned, to enjoy the fancy hotels, to look for romance, all experiences they could have had at home at a much cheaper price. Italy is wasted on those, but those are indeed a tiny minority, a phenomenon already observed by Aristotle more than two thousand years ago when he said that youth is wasted on some young. There is however another phenomenon which has nothing to do with age or gender or time. A phenomenon I have been observing for some time now, every time I return to Italy; but to notice it may require a modicum of maturity and wisdom even in the young. It is the conception of Italy as some kind of museum; a museum about which one takes as many pictures as possible in order to take them home to place in one’s albums. As the slogan goes: one goes to Italy to see the sights. The sights are usually Venice, Florence, Rome and sometimes Pompei thrown in as a bonus. Pompei is instructive, since it is a dead city wonderfully preserved, it is in effect a museum always full of tourists incessantly shooting pictures. If we are not careful Venice may eventually become another dead city or museum. On an average a thousand people leave the city every year. If the trend continues it will be a dead city in one hundred years, where one will only see tourists roaming and milling around. As it is, especially in the summer, one notices precious few Venetians in its streets. It takes a movie such as Bread and Tulipans to remind us that people actually live and suffer and hope and despair and work out their destiny in Venice. Those people living there seem to resent the tourists who invade their city every year while at the same time providing a living, the only possible living, for them; surely a schizophrenic situation. If the reader is wondering where do those Venetians move when they leave Venice, they should know that they mostly move to Mestre, an industrial city, as ugly as they come, with the dubious distinction of being one of the destructive polluting factors of Venice slowly killing the city. In a sense Venice has become the symbol of our brave new world which prefers comfort and material prosperity to beauty and has killed the very concept of beauty replacing it with the shocking and the vulgar. This modern phenomenon can be encapsulated by the exclamation of a student on another trip: “how beautiful Venice is!” But you see, he was referring not to Venice but to Mestre which is the last city before arriving in Venice. If Mestre proved to be a beautiful city to this student’s eyes one can just imagine the ugly place he must have came from. That is why this year I decided not to take a camera with me and focus on just enjoying the sights without the anxiety of capturing them, and most importantly interacting with the people who live in Italy. It is hard to do that with a camera covering one’s face. I don’t know if this was noticed by the students. In case they did, now they know why. It was not because I could not afford a camera. I trust they noticed that indeed there are people living in Italy and they speak Italian and they congregate in the piazzas where they carry on interminable conversations replete with expressive gesticulations on the meaning of their heritage and civilization within modern society. Unfortunately few students stop to talk to them, for they are too busy taking pictures of the sights to bring home. I always manage to meet one or two of those interesting erudite people every time I go to Italy. I met one this year too. His name is Norberto Lombardi and he happens to be the regional representative for the Molise region in Rome. I met him on my way back from a quick visit to Bitonto in the southern region of Puglia (I left the students for a few days in the capable hands of a colleague from Broward College) to visit my bed-ridden mother. On the way back by train I stopped in Campobasso where Noberto, the director of the Urbino Program and another colleague who also heads a program in Urbino were waiting for me at the station. Noberto took us with his car to visit the Roman excavations recently found near Campobasso complete with temple and stadium. It was like visiting a mini Pompei with a difference: this was not a mere archeological site. Farmers had been living on top of these excavations. Some of them have been convinced to leave the area with some compensation and some are still living there. The houses they live in are very rustic and almost as interesting as the Roman ruins themselves. We had a great time discussing this intriguing phenomenon of archeology and folk culture coming together, i.e., of Italy as a museum vis a vis a living country within modernity. This article would become far too long if I were to even partially repeat here the discussion. Afterward Norberto took us to a tour of the city of Campobasso (the capital of Molise) giving us all kinds of historical and cultural details on everything we saw, and then treated us all to a very good trattoria where the spirited conversation continued over local food and good wine. The next day Norberto further treated us to an incredible folkloristic feast whose tradition goes back two hundred years but more likely to pagan times: the so called feast of the grain of Saint Anne celebrating contadino (farmer or what Silone calls “cafone”) culture in the region. It takes place in Jelsi, the town where the director of the Urbino Program, Mike Vena, was actually born and from where he emigrated at the age of 18. People in the procession which had some 40 carts and lasted a couple of hours were dressed up in their typical folkloristic costumes, some of them dancing the tarantella and singing local songs in dialect. 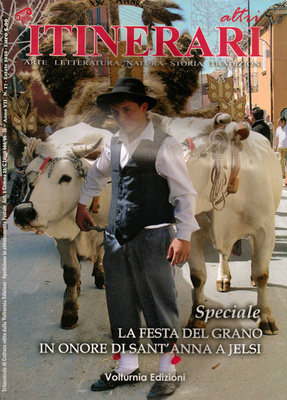 The focus was on the carts pulled by gigantic Marchegiane white cows with various imaginative representations all made with grain. Even though the feast is dedicated to St. Anne (the grandmother of Jesus Christ and therefore to the wisdom of old age) the feast is a pagan celebration of the fertility of the land. Here again I took no pictures but I did buy a booklet illustrating the feast with an article by Mike Vena in it reflecting on the bridge between two cultures which the immigrant represents abroad. Afterward it occurred to me that it was indeed sad that our students are not offered a glimpse of this rustic culture of the people from time to time. That they are taken from Rome upwards to see and photograph “the sights” and thus given the erroneous impression that all that Italy has to offer is from Rome upwards and it is all in museums; that is to say, Italy is a museum to be seen and preserved in pictures while ignoring the people who actually live there. It is sad that the students are never given a hint of the important fact that before they spoke Latin in southern Italy they spoke Greek and that in fact the whole of southern Italy was called Magna Grecia and the very name Napoli means new city (na polis) in Greek and it was there before Rome; that Greek temples exist in Sicily in Agrigento and in Paestum near Naples which are better preserved than the ones in Greece. While ruminating on these thoughts on the last days of the program in Rome I picked up La Repubblica and there read a sequel to last year’s scandal of Berlusconi’s escorts in the people’s palace. It was revealed that it was not just one but dozens of escorts which were provided for his cronies too. I thought to myself: how bizarre, but then again, what else is new in Italy? The answer came a day later when I went to St. Peter Square and low and behold I found it full of young people between the ages of 14 and 24 singing and waiving their flags from all over the European Union and waiting for the Pope to appear which he did eventually; there were some fifty thousand of them. I did notice that you did not have a camera! I, on the other hand, could not capture enough of the milestones each of the students were realizing for the first time. The look of awe on the face of one of the participants when we entered with the first 20 people into San Pietro as the doors opened at 7:15 AM will never leave me. I had visited it so many times and for more special occasions than an early Thursday morning walk, but on this last visit I was more profoundly touched than ever before. And then there was the scenic beauty that is present in every nook and crany of Italy. More than once I heard these exclamations: "It really is like you see in the movies! ", "I wish my friends and family could see what I am seeing now! ", "How many times could you wake up to this scenery before you realize it isn't a dream?" and "There is no photograph that can capture this beauty!" The program offered an opportunity for these students to be tourists, but also to walk off the beaten path and mingle with the locals. Few attempted this, some for fear of their mediocre knowledge of the language. Those who did were richly rewarded. Friendships were formed, language barriers toppled, and inner sanctums were entered. It is also true that some students did not embrace the true value of this study abroad (as the instructors perceived it) and would have benefitted more from a staycation, but even they will have gleaned something worth sharing with their friends back home and even they will have been impacted in a positive fashion from this experience. Great to read about your travels, Paparella - makes me miss Italy. It's true that youth is wasted on some youths, but surely the trip will also be a lifelong memory for some of your students. Indeed,I dare say that it will for all of them but some of those memories will be more meaningful and relevant than others depending on the knowledge and wisdom acquired; which of course does not get older people off the hook; their traveling experience can also vary considerably,hence the importance of a diary as a record and remembrance. Shakespeare had it on target: maturity is all, and it may come at almost any age, if at all. Congratulations on another successful and beautiful summer program. May your most valuable contribution to Broward College and Florida continue to grow and prosper. Renaissaince, renewal, to rediscover in one's self the art of living - for this Italy and the Italian experience remain incomparable in the development of western culture. Great read. We have been to Italy 5 times and still cannot get enough of it. My family is from Sicily, (a different culture), we hope to visit there soon. Thanks Domenica for the valuable feedback placed in Ovi as a colleague and fellow participant in the Urbino 2010 study trip. Indeed I concur that the learning experience of both students and professors on a study trip will vary depending on their attitude toward the host country. As mentioned in the piece, if they come to Italy with a desire to learn and understand (i.e., to stand under) rather than merely document “the sights” with a camera standing over in order to place them on face-book or to take home to their album, their experience will have been so much the richer; which is not to denigrate musueum and “the sights” of monuments. You may have noticed that there was at least another student (Natalia) who did not take pictures and in fact replied personally to me that she agreed that too much emphasis on a camera to take pictures may well prevent one from interacting with the people of the country one is visiting. You may have noticed that she did not drink any alcoholic beverages. That too, when abused rather than used, will take away from the full experience of a trip abroad and can be carried on more cheaply at home. There are however two larger points made in my observations that perhaps need to be emphasized: 1) that the high artistic culture of Italy and its folkloristic culture need not be mutually exclusive: they can be imaginatively harmonized so that one does not end up considering the whole country a big museum, 2) that it is a mistake to give students the impression that everything worthwhile in Italy begins with Rome, goes through Florence and ends in Venice while Southern Italy (the other Italy) can be safely ignored. You will have noticed that while we were in Florence, at palazzo Medici-Riccardi there was an incredible exposition of Baroque sculpture and painting entirely from Southern Italy. I roamed around for a couple of hours and could not believe my eyes. I took no pictures but neither did I see any students there taking any. Did they just miss it or did they see the advertisement for it as they walked by and simply pass on, and if so why? The point is this: if the high baroque art of Southern Italy is good enough for the Florentines to place in one of their more prestigious museums, then it ought to be good enough to bring our students to see it on location together with the more folkloristic aspects of the region, such as the feast of the grain in Molise. Nobody has yet convinced me that it is a bad idea to bring students to a southern region from time to time to see “the other Italy” which can well compete in artistic treasures and natural beauty with the rest of Italy, not to speak of the friendliness and generosity of its people. Come to think of it the Urbino program used to have on its traveling agenda, Capri, Sorrento, Naples, Pompei. No longer. Even Venice has been eliminated. Shall we wait that Venice becomes a museum, like Pompei, to bring them there? I propose, and I hope to get some support for the proposal, that we consider taking our students to a southern region of Italy from time to time. Are you sure that "before they spoke Latin in southern Italy they spoke Greek"? Do you not think that when the Greek colonizers arrives in the peninsula, they met indigenous people speaking an indigenous tongue? se vi ha voce latina di sapiente significazione che abbia indi l'origine, ella s'abbia a stimare essere stata quella molto innanzi portata da Toscana in Magna Grecia e, prima che in Magna Grecia, nel Lazio. Dr. Paparella, apologies for the typo in your name. Mr. Andreacchio, I stand by what I wrote. You are clearly mixing apples and oranges and confusing historical eras and languages, thus obfuscating the subject at hand or perhaps revealing some ignorance in the matter of which you need to unburden yourself. Let’s see if I can be helpful here. Your statement above is an obvious distortion of what Vico writes in his The Ancient Wisdom of the Italians as regards the origin of their various languages, two of them being Latin and Etruscan. Nowhere does Vico says that Latin was being spoken in Southern Italy (a Greek colony since the 8th century BC) before Latin (Rome does not come to the fore till 500 BC) or that Etruscan, which he clearly says entered Lazio before Magna Grecia, was the same language as Latin. In fact even today we don’t know where exactly Etruscan came from. They are indeed two different languages. It was not till 350 BC that Rome emerges as the dominant city in Central Italy. The Roman empire actually begins in 510 BC and Southern Italy is conquered much later; it is then that Latin enters Magna Grecia; meanwhile Greek had been spoken there and is in fact still today being spoken as a dialect in parts of Puglia (the Lecce region) and Calabria . The Etruscan culture spans historically some 800 years from 900 to 100 BC and Vico is right when he says that it precedes that of the Greeks in Southern Italy, but that does not mean that Latin was being spoken there when the Greeks arrived to colonize the region. Rather, what must have been spoken rather extensively are the languages of the indigenous people of the region; Latin was not one of them since Rome had not yet began its expansion in Italy. I attach here below for your homework some more detailed information on the matter gathered from public encyclopedic sources. "Knowledge of the Etruscan language is still far from complete. The Etruscans are believed to have spoken a non-Indo-European language; the majority consensus is that Etruscan is related only to other members of what is called the Tyrsenian language family, which in itself is an isolate family, that is, unrelated directly to other known language groups. Since Rix (1998) it is widely accepted that the Tyrsenian family groups Rhaetic and Lemnian are related to Etruscan"
"The history of the Etruscans extends before the Iron Age to the end of the Roman Republic or from c. 1200 BC to c. 100BC Many archaeological sites of the major Etruscan cities were continuously occupied since the Iron Age, and the people who lived in the Etruria region did not appear suddenly, nor did they suddenly start to speak Etruscan. Rather they learned to write from their Greek neighbours and thus revealed their language. Archaeologists and linguists are in agreement that the Etruscans had been developing their culture and language in situ before the first historical record of their existence." In the eighth and seventh centuries BC, for various reasons, including demographic crisis (famine, overcrowding, etc. ), the search for new commercial outlets and ports, and expulsion from their homeland, Greeks began to settle in southern Italy (Cerchiai, pp. 14–18). Also during this period, Greek colonies were established in places as widely separated as the eastern coast of the Black Sea, Eastern Libya and Massalia (Marseille). They included settlements in Sicily and the southern part of the Italian peninsula. The Romans called the area of Sicily and the heel of the boot of Italy Magna Graecia (Latin, “Great Greece”), since it was so densely inhabited by the Greeks. The ancient geographers differed on whether the term included Sicily or merely Apulia and Calabria — Strabo being the most prominent advocate of the wider definitions. Many of the new Hellenic cities became very rich and powerful, like Neapolis (Νεάπολις, Naples), Syracuse, Acragas, Sybaris, (Σύβαρις). Other cities in Magna Graecia included Tarentum (Τάρας), Epizephyrian Locris (Λοκροί Ἐπιζεφύριοι), Rhegium (Ῥήγιον), Croton (Κρότων), Thurii (Θούριοι), Elea (Ἐλέα), Nola (Νῶλα), Ancona (Ἀγκών), Syessa (Σύεσσα), Bari (Βάριον) and others. Mr. Paparella, Is it your habit to call "distortion" any question you don't like? Perhaps I was not clear enough, but I am glad that you bring up the Etruscans as having settled into southern Italy before the Greeks. But there is more to the story. "if there is a Latin spoken-term of wise signification that has origin there, it must be estimated to have been brought long before from Tuscany in Magna Graecia, and before Magna Graecia, in the Lazio region." The expressed grammatical "subject" is Latin, not Etruscan. Now, Latin was a PRE-ROMAN tongue that some retrace as far back as to 2,000 BC, when "the Latins" are thought to have been in the "Lazio" region. Hence a legitimate question: if the Etruscans (who initially settled in what today are sometimes called protolatin regions) brought Latin terms/influences (voci) in south Italy, might this not have been before the Greeks established colonies in the region? It seems to me that nothing in what is generally "known" about the subjects precludes this possibility. One suggestion in closing--that Vico is not interested in establishing exact dates, but in clarifying that the "wisdom" (read: authority) of the Latin tongue preceded Greek influences...even in Magna Graecia. I reiterate: I stand by what I wrote. It is not at all a question of what you and I like or don't like; the issue rather is what are the historical facts and what are merely fabricated egregious rethorical statements which don't square with the reality of those facts.